This summer, going unnoticed is out of the question! 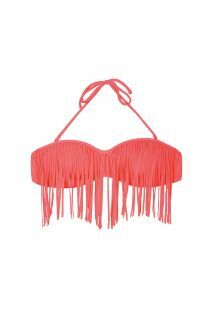 To attract all eyes on the beach, go for the "colour block" trend with this neon bikini that will be perfect on you. Lemon yellow, bright orange or lively green: these sparkling, eye-catching colours will give you a splendid glow. Just as seductive yet more discreet, neon bikini embellished which fluorescent touches are in style this season. Take advantage of the trend to add some light to your summer wardrobe with Neon bikini... On the beach or at the water's edge, success is assured! This summer, go for the "colour block" trend with this fluorescent bikini, for a fun and refreshing look!